Willie Crockett, the artist at Crockett Gallery speaks with the strong dialect unique to Tangier Island where he was born. He paints with the strength of a lifelong intimate knowledge of the marshes where he grew up fishing and hunting waterfowl. 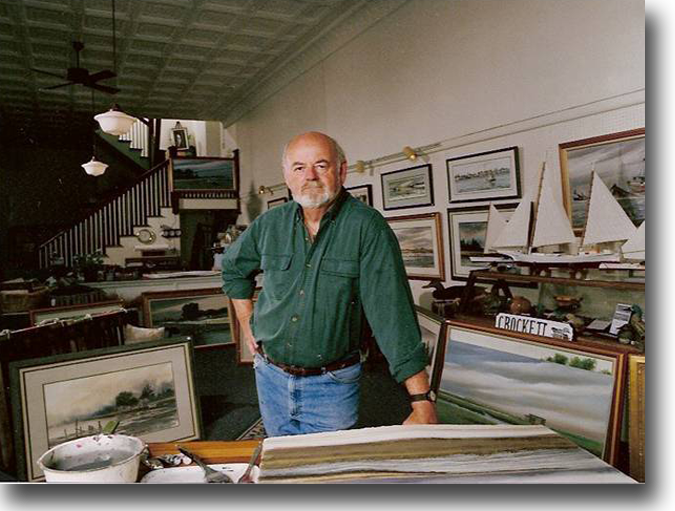 His paintings are recognized as being among the most honest portrayals of Chesapeake Bay drama and beauty. Best known for his wildlife art, Willie transmits to his painting an ever fresh view of the Eastern Shore landscape, the wildfowl and the marsh. An occasionl easy transition into colorful abstracts and flowers speaks for the versatility of the painter and the sensitiviy of the man. While best known for his glowing watercolors, Crockett has been working more recently in oils and acrylics as well.